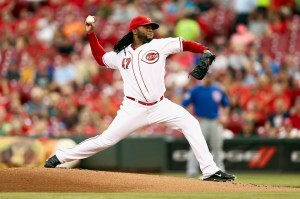 Johnny Cueto has good mechanics, but don’t do what he does? If you’ve seen Johnny pitch you know it looks like he has an unorthodox style of throwing. He does! When he lifts his leg he really twists his upper body, so much sometimes that his back if facing home plate. You would think that he has horrible mechanics. Well, he doesn’t. He has a different “style” of throwing but he’s got great energy toward the plate. In this picture you can see that all of his energy is going where it needs to go. His head is over his center of gravity “belly button”, he’s in a great equal and opposite position with his arms and his hips are rotating before his upper body. If you watch some of his highlights on youtube you will also see that his energy continues toward the plate throughout his entire throw. So why not do what Johnny does? When pitchers try to mimic other pitchers like Johnny Cueto because it looks cool, or they think it gives him power; it really messes up their own delivery. Most youth pitchers can’t do what he does when he lifts his leg. If they attempt it they would most likely fly open at foot strike. Most of their momentum would be going to the first base side if they were right handed. There is a significant difference between style and mechanics. You need to be able to differentiate the two. There are things all pitchers “must do” to throw faster and keep their arms healthy. I put together the 4 Disc Pitching series to show pitchers where real velocity comes from. To show you and other pitchers how to throw faster and maintain pin point control of each pitch! You will also learn how to add a ton of movement to each pitch while maintaining proper throwing mechanics with each pitch. The Boston Red Sox Mental skills coach, Justin Su’a, will teach you how to play with a Major League mindset.